During the past year I have been blessed along with many other volunteers to provide assistance in helping the homeless guests in our community. The joy and the satisfaction received as this years cold season begins is knowing that many of the guests serviced last year have found jobs and a place to live. Though I miss many of those guests, I am thankful that they have been given such opportunities. Unfortunately there is still a need to help the homeless guests in our community. There is a need to provide food as well as a warm place to sleep. We can provide this service as long as there are enough volunteers to keep the program going. Our most demanding need at present is for overnight volunteers. Being an overnight volunteer is not a difficult job. When I first started volunteering I was apprehensive about safety or the ability to communicate with the guests. It didn’t take long to realize that the guests were people just like myself. They needed a place to get a meal, a warm bed and love. The routine for overnight is quite simple. I arrive at the shelter around 8:15 in the evening & check to make sure the totes are ready for the guests and the cots are available. When the guests arrive between 8:30 and 9:00 they set up their cot, get their bedding, put there personal effects in the totes and after some socializing go to sleep! In Milford the guests usually get up around 6:30 AM, put the cots and bedding away and take their personal effects. There is a short time for coffee and clean up of the facility. They leave by 7:00 AM. 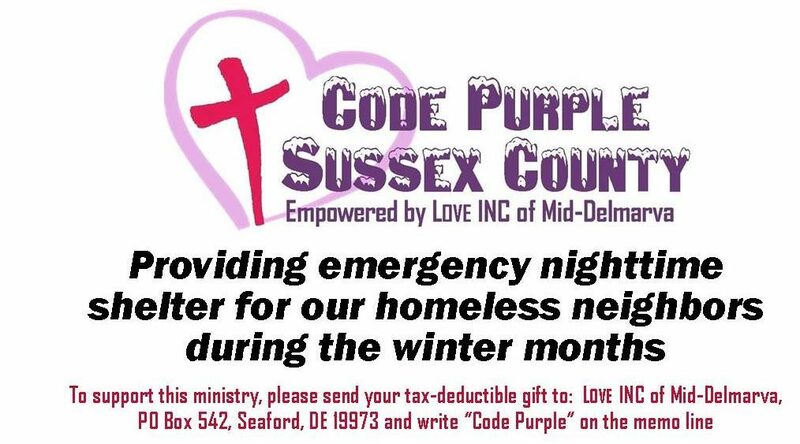 I have experienced a few challenges over the past year but the support of the Code Purple staff is overwhelming. Volunteering and helping our homeless guests is not only personally very rewarding , but the right thing to do.